Private Libraries' Association, 1970-12-01. New impression. Hardcover. Used:Good. London, UK: Private Libraries Assoc., 1970. Hardcover. Fine/As New. Size=5.5"x8.5". (full book description) Private Libraries Assoc., London, UK, 1970. REPRINT Edition Fine/Fine-, Hard Cover, DJ with Mylar. Size=5.5"x8.5", 242pgs. DJ price clipped, "Now reprinted with an Epilogue." Clean, tight and bright. No ink names, tears, chips, etc. DJ in mylar sleeve. [Book Collecting] SELLING WORLDWIDE SINCE 1987. WE ALWAYS PACK WITH GREAT CARE! 1949. CARTER, John. 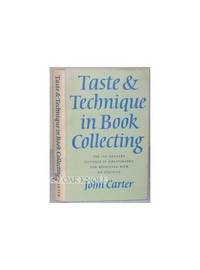 Taste & Technique in Book-Collecting. A Study ofRecent Developments in Great Britain and the United Sttes. 8vo, orig. cloth, d/j. Cambridge: At the University Press, 1949. Second impression, corrected. Fine. Cambridge University Press, 1949 A second impression of this classic work. The grading NF takes in the age factor. The unclipped jacket is protected. The binding is firm. Yes, it does look its age, but it has no abuses. Language: eng Language: eng 0.0 Language: eng 0.0 Language: eng 0.0 Language: eng. Hardcover. Near Fine/Near Fine. London: Public Libraries Assn, 1970. Book. Near Fine. Hardcover. NF/NF, gorgeous copy with price intact on flap, 8vo, 242pps w/index, bp of book collector Frank M. Halpern. Reprinted from 1947 lectures..